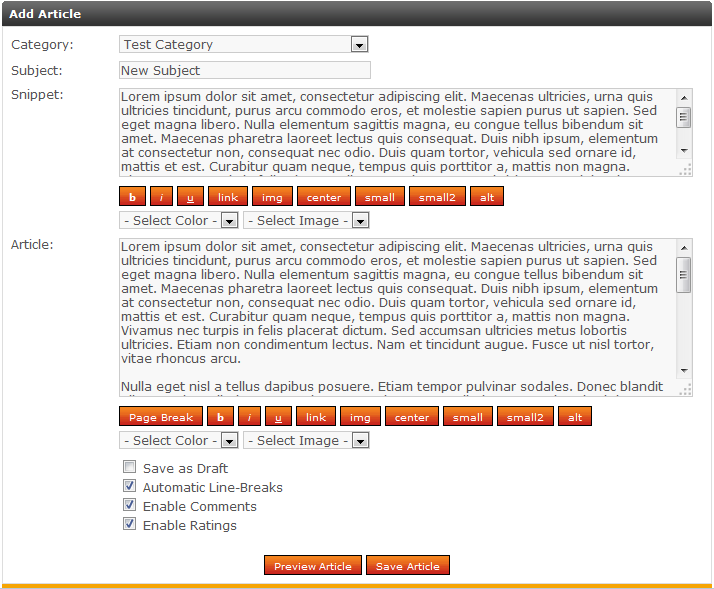 After you have created at least one category in Php-Fusion, you will be ready to create your first article. An article is a component of data, usually much like a web page. Below are the instructions on how to create an article in your Php-Fusion website. Log into your Php-Fusion admin interface. You are now on the article data screen. Enter your data here for your new article. Select the category to place your article under. The name of your article. A short snippet, or piece, of the article to display. The entire body of the article. Once you have entered the data, click on the Preview Article to review it. A preivew of the article will appear at the top. Once you are satisfied with the data in the article, click on the Save Article button at the bottom. The article will now save and appear in the Articles list. Below is a display of how our sample article will appear.